I thought I could paint more loosely, less tightly, if I painted small. Instead, I painted tighter than ever, trying to hold onto control of the painting! 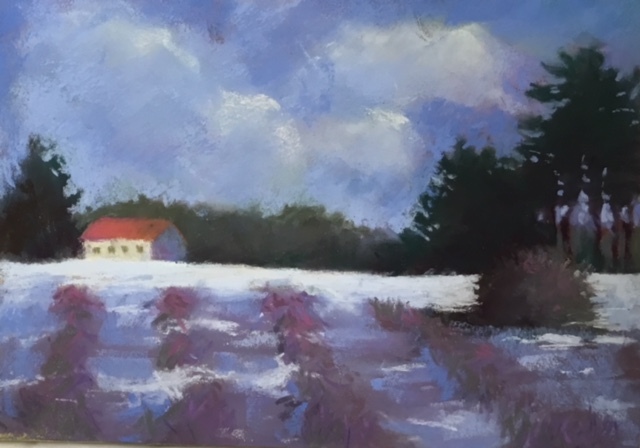 Well, at least I was trying to push myself out of my comfort zone at the Robert Carsten workshop this past weekend at the Southern Vermont Art Center. It is amazing how we resist ourselves, even when we want to change the way we do things. The painting above is an example of this. I'm not displeased, but I was wanting to let go of my old ways at this workshop. Robert is an excellent teacher, by the way. Take a class with him if he comes to your area. Taking classes and one time workshops can help you come out of your comfort zone. My classes will be taking a winter recess, but will return in January! Stay tuned... and keep playing with your pastels! 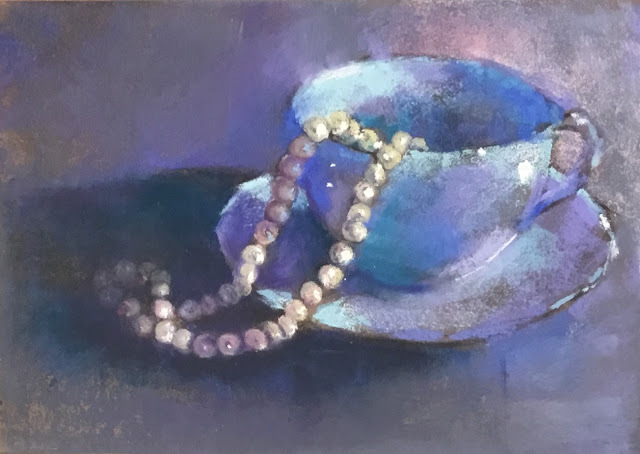 I am more than happy to learn that this painting has been accepted into the 2017 International Association Of Pastel Societies, (IAPS) online juried show. I don't know what criteria the jurors used to select this painting but composition may have played a part. 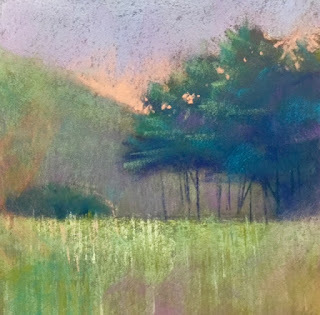 We have been discussing composition in the class I teach in beginning pastel. I wish that I had had more instruction in how to create a painting with good composition. So that is why I try to teach this early on in a beginner's experience. One thing to consider is "point of view." This painting looks down on the subject rather than composing it from a straight on point of view. This does not necessarily make it better or more interesting, but is something to consider when looking at a subject. There are also "leading lines" (the spoons) and "repeated pattern" (the rims of the cups) that contribute to the success of the composition. 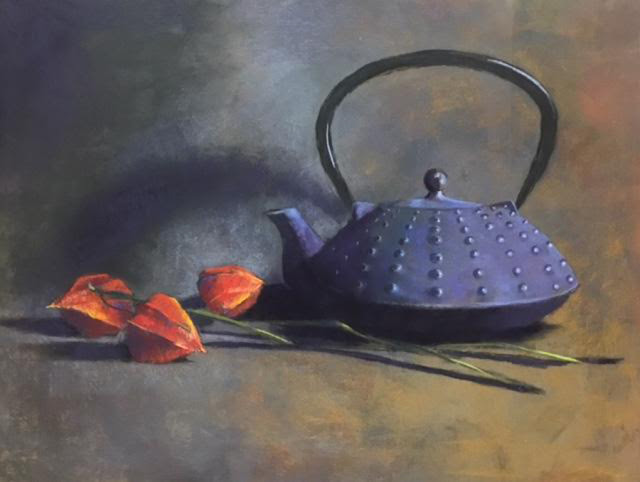 I was surprised to learn that I won an award at the Vermont Pastel Society's juried show this past week. 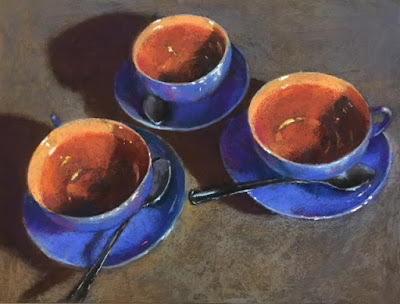 The Judge was Doug Dawson, an important and revered contemporary pastel artist. I was just happy to get in! 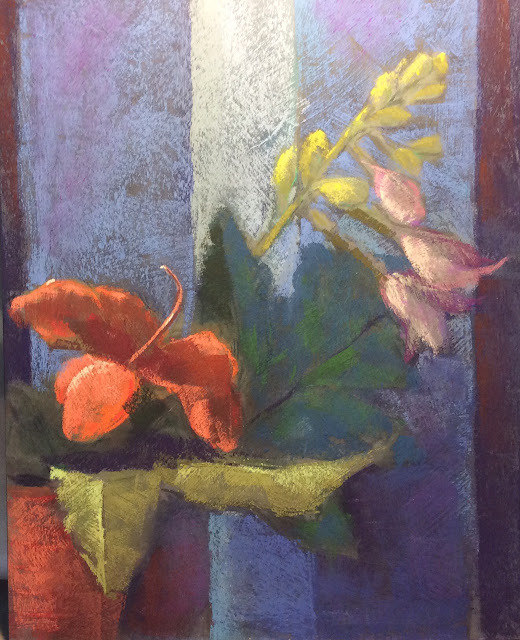 This painting, "Open to Everything"won the Pastel Society of Cape Cod Award and I am very honored. Mr. Dawson said that he liked "the simple direct strokes and the way the artist exploited the surface quality of the board." Did he know that this was a disaster painting that I washed off and re-surfaced with clear gesso and repainted? Sometimes I think these master pastelists are wizards! 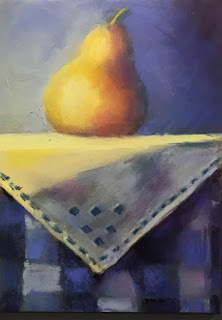 He was right, I was responding to the rougher quality of the surface and because I had already failed at my first attempt, I allowed myself to paint more directly. Almost defiantly! Thanks to all of you who came to the Open House on October 26th to see my work in my second corporate show, "Tea & Co." here in Middlebury, VT. The music, the food and the enthusiastic crowd was wonderful! We are all on a journey of one sort or another. Being new in the area, I was touched by the number of my new friends who came out to support me on a rainy night as I follow my artistic journey. Making art is risky business! We put ourselves out there even knowing that our work will be judged. Liked by some and not by others. It can be very scary, so I find it is important to surround myself with people who are going to "lift me higher." Using repetition in the design of a painting is much like including the drum beat in a musical composition. It can drive and move the piece. With the addition of some variations it can really be pleasing to look at. The variation, of course, is in the differing variations of placement in the teaspoons. If you are having trouble thinking of a good composition for your next painting, try out this concept. And have fun playing with your pastels! My go-to recommendation for myself or a loved one who is upset or agitated is to "make a cup of tea." 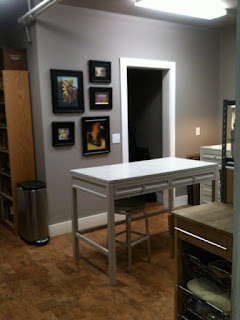 I serve tea in my studio where I teach classes, too. It is good to step away from our work and unplug for a few minutes to let the art-making settle into place. We can then return, calm and with clear eyes, to continue on the journey of making something beautiful. Our feelings of stress in painting sometimes come from our unwillingness to plan a little before we begin. Take time to make a map. 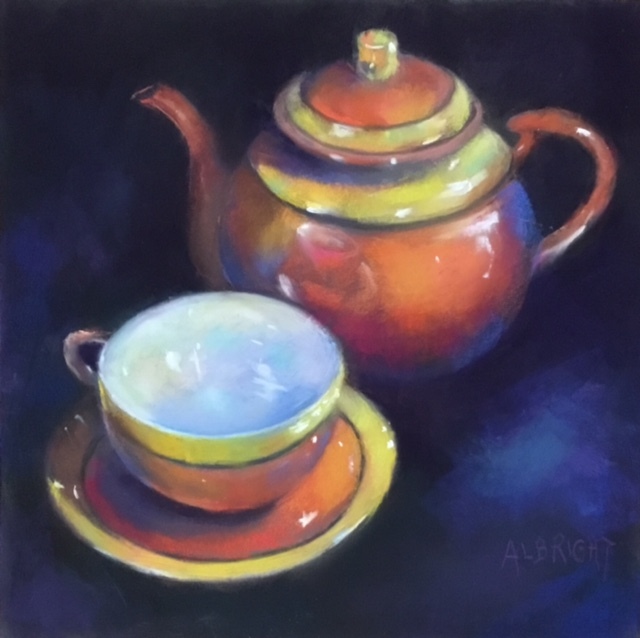 I was more relaxed and happy doing this painting, "High Tea", because I mapped out two important steps before I began. I carefully drew my subject with charcoal. With this subject I knew I had to get the ellipses pretty perfect! I used my kneaded eraser a lot!I spent a lot of time adding values to the drawing with charcoal. What should I paint? Sometimes I feel stuck and uninspired. Sometimes I want to paint, but I just can't seem to find the right subject. Has this ever happened to you? If your thoughts about what to paint feel frozen and you feel somewhat panicked, stop and breathe! The place to start is where you feel calm and relaxed and happy. Do you love your garden? 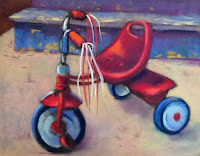 Then go there and choose something to paint that brings you joy. A single flower blossom in an old medicine bottle, perhaps? Maybe you have a favorite walk you take to unwind and shake off the cares of the day. Stop and take a reference photo of the light through the trees or a spectacular sunset. If we are open and maybe even a little vulnerable, inspiration will choose us. Be open to the moment and breathe. "It doesn't matter what color you choose, as long as you have the right value!" It makes sense to most, but I do understand that it is a difficult concept when you are first learning to paint. In my last class I asked my students to predict what the color of the sky would be in a painting based on a black and white photo. The answers varied, based on the value they were looking at and the sky color that made sense to them. Below is the photo without the colors that I chose for this composition. Notice that there are four values. The sky is the lightest value and the ground is the second lightest. The distant hills are a medium dark and the upright trees and bushes are the darkest. What would guess the sky color to be? My sketch journal feels like an art buddy to me. I didn't keep one early on in my journey to become able to paint and draw and I'm sorry that I didn't. Since I began keeping them I now have a record of workshops, thumbnails for paintings yet to come and a companion as the journey progresses. I don't just keep sketches, I keep notes from workshops. New things I have learned about color and composition. And ideas for a series or painting titles. Of course the most important thing about a sketch journal is that it gives you the opportunity to work out the values and composition with pencil and an eraser! Students! If you are taking one of my classes be sure to bring a sketch journal and pencil, preferably a soft pencil that will make dark marks. I like the Cachet Classic sketch books 5.5x8.5" which you can get here at Jerry's Artarama. I have been getting the studio ready for my new classes and thinking about the many wonderful teachers that have helped me in my artistic journey. Pieter Lefferts, Nancy Cassidy, Peter Seltzer and so many more. I realized that I have to get myself ready too! New Students and those thinking about taking a class in the future... take a look at older blog posts to get inspired and motivated! Botanical and Floral Art Competition Blossoms on Main Street, pastel, 12x12" I am happy to announce that I have received two awards in Light Space & Time Online Art Gallery's August 2017 show, "The 7th Annual Botanical & Floral Art Exhibition." "Blossoms on Main Street" won in the Special Merit Category and "Bee Still" received a Special Recognition Award. This international art competition received submissions from17 different countries and from 37 different states. Overall, 720 entries were judged. Bee Still, pastel, 12x16" View the show here! All participating winners of the competition have their artwork exposed and promoted online through the online gallery and through social media to thousands of visitors each month. The studio is ready for art-making.Classes will start in September! As many of you know, my husband and I moved to Vermont about a year ago to be closer to my daughter. We bought a fixer-upper house in Middlebury, Vermont and dove into a very huge project! 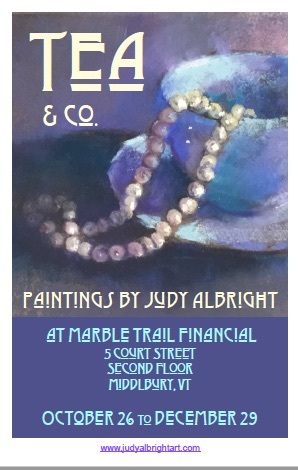 I have just formed Judy Albright Fine Art LLC and I now have a wonderful new studio space where I will be able to teach painting and drawing classes. In addition, I am working on developing some one-time art experiences called Creativity Uncorked!More to follow on that!